In part one of this series, we talked about the performance expectations that define the scope and general objectives for a successful eLearning project. Now we’re going to look at the many different experts that have to come together to make an effective and interactive training resource. Today’s focus: P = People. It takes a village to build an eLearning course—which is something clients don’t often fully grasp. However, if you can walk them through the different pieces that will bring their course to life, you can begin together on the same page. So who will be the players involved in the process? Let’s take a look. The Project Manager (PM) can reside within a variety of different departments. Sometimes the PM is assigned from a dedicated project management group, sometimes he or she is in the Education/Training Department, and sometimes the PM is outsourced. When a eLearning vendor is used, the vendor may assign a PM to oversee instructional designers engaged in a large project. In smaller projects, the instructional designer may serve as the PM. Regardless of where that title falls, each person on the project has some management responsibilities. We can’t all be experts at everything—and that’s where the Subject Matter Expert (SME) or Content Expert comes in. This person can create or provide existing content for your eLearning course, provide critical review feedback, and help write test questions. Some content experts have a difficult time seeing the value of the instructional designer who knows little or nothing about the content, and as a result, this becomes a slippery slope to manage in terms of roles and responsibilities. The Instructional Designer (ID) helps gather information from the SME and other experts, determines the appropriate scope and sequence in which to present the content, and creates instructional design documents and storyboards. This is where the course really begins to take shape. Other duties might include providing input on the creative treatment, preparing audio and video scripts, writing test questions, and more. The Instructional Designer typically wears many different hats and is sometimes expected to be the designer, graphic artist, and developer on the project. Graphic designers. Provide color scheme and branding guidelines, create user interface wireframes and layout templates, and provide graphics for the course. Videographers (can be internal or outsourced). Coordinate video shoots or edit videos to repurpose. Locate and purchase the necessary stock photography, coordinate photo shoots, and work with the client or ID to incorporate graphics. Voice Talent. Coordinates with professional voice talent or employees to record the audio portion of the course. The Developers (authors or programmers) are the ones who write the programming code, input content into eLearning authoring tools, create interactions and activities, insert all assets, and then publish the course. They also help handle any troubleshooting issues that may arise in functionality or delivery through the LMS. Typically this is the client’s internal resources but might require help from the LMS manufacturer. If bandwidth or browser issues arise, these specialists steps in to help. They also provide LMS settings and guidelines, define the file directory and file management protocols, and act as an internal resource for any technical troubleshooting. 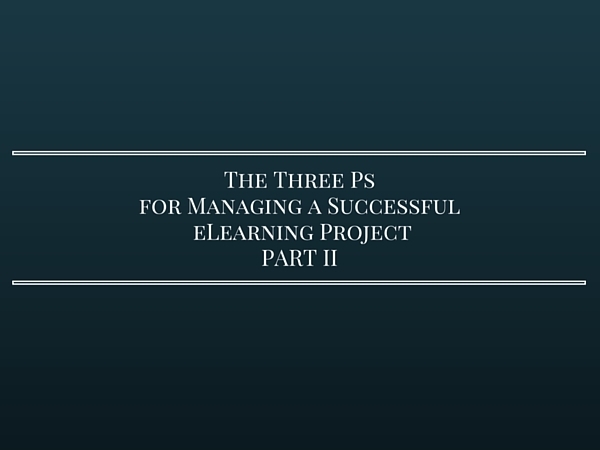 On Thursday, we’ll discuss the third and final ‘P’ in managing an eLearning project: the Process. Part three is all about how all of these moving parts work together seamlessly and efficiently throughout the eLearning project development.